If you've seen one rock you've seen them all, right? Not where we've been. 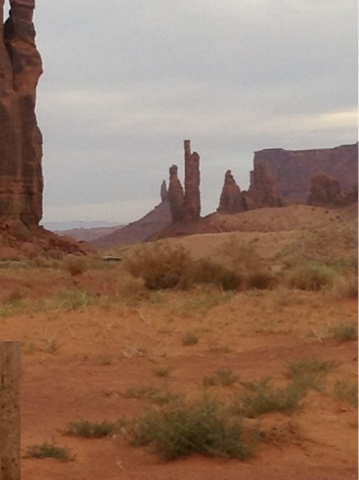 We hit Monument Valley first. All I can say is totally awesome. We stayed there several hours until sundown so we could get some sunset pictures of the rock formations as the sun set. The memories will stay with me forever. Or less than forever if I get dementia. This is just one of hundreds of photos I took using the camera, iPad, and iPhone. We got to tour the entire valley by vehicle. The park suggested high rise vehicles but I even. Saw a Saturn driving through there. I hope they made it through all right. The road terrain was pretty gruesome in places. From there we went to Arches National Park. We toured that mostly by vehicle as well, only getting out in a couple places to stop and take pictures or walk to an arch inaccessible by road. Our final Utah sightseeing stop was 9 Mile Canyon. Don't let the name fool you. The canyon isn't 9 miles long. It's actually 75 miles long and sights are few and far between. And you have to get out and hike trails to the sights. What are the sights you ask? 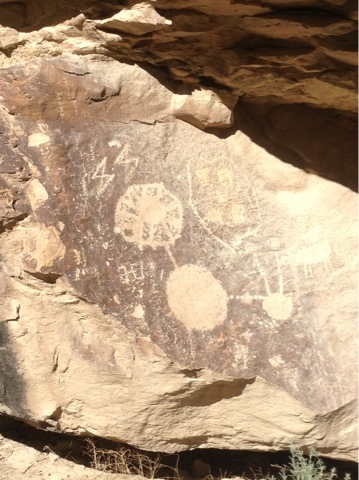 Petroglyphs, of course!! We saw some amazing drawings from various ages of Indians. Some thousands of years ago others a lot newer. So, as I type, we are driving through Idaho on our way to Yellowstone National Park which we'll reach tomorrow. It's been an amazing trip through the wild Wild West. Arches National Park was truly stunning. I didn't get any pics with my ipad as we traveled so couldn't post. But, we did get some amazing pics with our SLR. Will be creating a website for the vacation soon and will post the link when it's ready.